"Nimisha" means a minute, the Goddess who resides in this temple is believed to grant the wishes of her devotees in a minute. 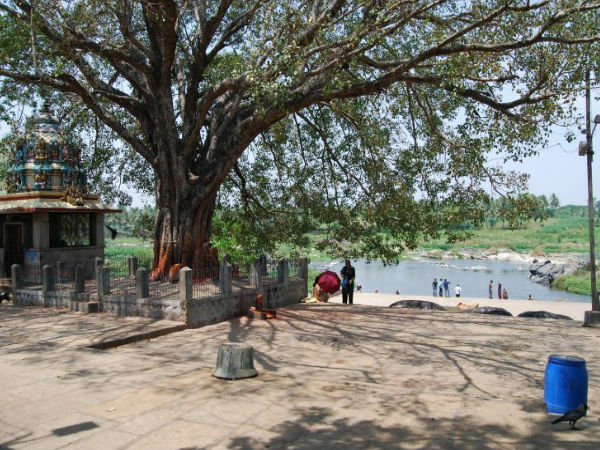 Nimishamba is another form of Goddess Parvathi, the temple is located on the banks of river Cauvery. The temple was built during the reign of Mummadi Krishnaraja Wodeyar around 400 years ago. There is a Sree Chakra imprinted in stone which is placed in front of the Goddess. The temple has a relatively small sanctum with a seven storied grand entrance tower. The Sree Chakra is believed to be inscribed by a King called Muktharaja on a stone, who later went into self-mortification. Devotees offer lemon and lemon garlands to the Goddess, the priests would take the lemons and bless them by placing them on the Sree Chakra and as well as at the feet of the Goddess and return them to you. It is suggested by the priests that you can either keep the lemons in the prayer room in your house for a certain number of days and drop them in flowing fresh water, wells or one can consume the juice of the lemons which is said to bring prosperity to the person. Along with Nimishamba, there are other shrines dedicated to Mukthieshwara (Shiva), Ganesha, Lakshmi Narayana and Hanuman. Varamahalakshmi and Durgashtami during Dasara are days when the temple witnesses huge number of devotees apart from Fridays. The temple mostly is not very crowded unless there is a sudden increase in the number of tourists. 6:30 AM to 8:30 PM. The temple opens at 4:30 AM on special occasions. The temple is situated at a distance of 2 kms from Srirangapatna, 17 kms from Mysore and 125 kms from Bengaluru. You can reach the place by the KSRTC buses which ply regularly from Mysore and as well as from Bengaluru, or your own mode of transport. If you are looking out for a place to stay overnight, you can check into Mayura River View or Ambelee Hotel Resort at Srirangapatna.